Yamazaki et al. (2009) reported two strong negative crochets during midday (solar flares on 8 June 2000, 3 July 2002), along the Circum-pan pacific magnetometers network (CPMN). The association of these with equatorial counter electrojet was doubted and suggestion was made to investigate the cause of these unique events. Present investigations were motivated by their paper. In this paper, detailed examination of geomagnetic data for the two events is made at all stations within 75°E (Indian) and 160°E (western Pacific) longitude sectors. 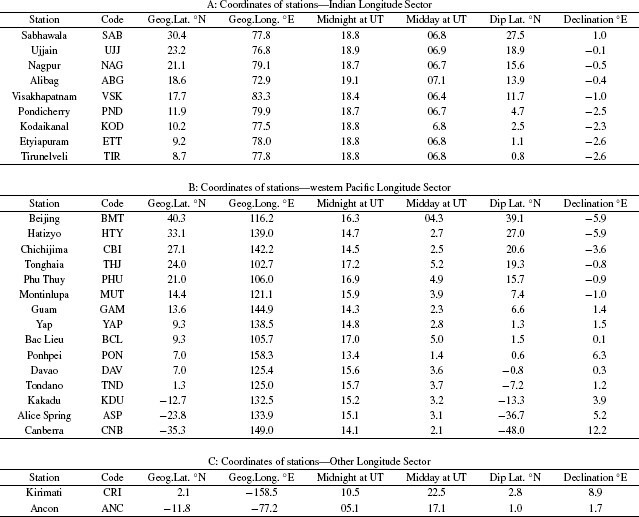 Latitudinal variations of ΔH on 18 June 2000 showed negative gradient towards the dip equator suggesting a partial counter electrojet both in the Indian and CPMN sectors. A partial counter electrojet also existed from morning to 1300 LT in the western Pacific sector on 3 July 2002. There are two current sheets over the equatorial electrojet region, one at higher level flowing eastward associated with global Sq current system and another intense current layer at 107 km, flowing eastward during normal and westward during partial/full counter electrojet periods. Solar flares are likely to affect the electrojet current more strongly as a result of the absorption, in the lower E-region, of the shorter wavelength solar X-rays flare spectrum. The first ground survey of the geomagnetic horizontal field from a chain of fourteen stations in Peru by Giesecke Chapman 1951) revealed that the daily range of H slowly increased from 7°S geographic latitude to a peak at 13°S (close to magnetic dip equator) by a factor of 2. This was explained by him as due to a narrow band of thin current sheet flowing eastward during the day time hours in the ionosphere (100 km) and named it Equatorial Electrojet (EEJ). Baker and Martyn (1953) pointed out that in the equatorial (magnetic) region the geomagnetic field, electric field and the vertical electron density gradient are mutually orthogonal. With the primary electric field eastward during the daytime, the electrons within 70–140 km altitude drift upward relative to the ions and give rise to a vertical Hall polarization field, that gives rise to an additional eastward Hall current. The effective conductivity is known as Cowling conductivity. Beyond 3° from the magnetic equator the polarization field leaks away along the inclined geomagnetic field lines and the enhanced Cowling conductivity is confined within a narrow range of latitude 3° north and south of the magnetic equator. The equatorial enhancement of Range H was observed later in Nigeria (Onwumechili, 1959), Peru (Forbush and Casaverde, 1961), India (Yacob and Khanna, 1963) and Tschad (Godivier and Crenn, 1965). Extensive observations during the IGY-IGC (1957–59) enabled Rastogi (1962) to detect a longitudinal variation of EEJ, being strongest in American and weakest in Indian longitudes. Matsushita (1951) found that in the dip equatorial region, the latitudinal variation of the top frequency reflected from the sporadic layer, fEs is very similar to that of ΔH. With number of ionospheric stations operating during the IGY within a narrow region of latitudes in Peru, Knecht (1959) identified the characteristics of Es associated with EEJ and called it Equatorial sporadic-E layer or Es-q. Knecht and Schlitt (1961) and Knecht and McDuffie (1962) showed the belt of Es-q is only about 700 km in latitude (α5° dip) coinciding with the belt of EEJ. 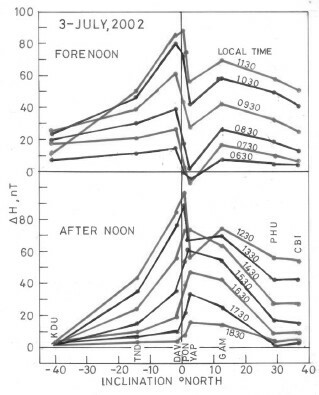 Bartels and Johnston (1940a), b) demonstrated an abnormally large lunar variation on the daily variation of H (SqH) at Huancayo such that on certain days the daytime values of H decreased below the nighttime value suggesting the reversed EEJ current direction. Cohen et al. (1962) showed an association between the disappearance of Es-q and a decrease of the H field. Gouin (1962) reported a depression of H on magnetogram at local noon at Addis-Ababa well below the night level on a very quiet day. Later Gouin and Mayaud (1967) named such events as Counter Equatorial Electroject (CEJ). Hutton and Oyinloye (1970) described the disappearance of Es-q during CEJ at Ibadan. Fambitakoye (1971) described the diurnal developments of the latitudinal profiles of ΔH and ΔZ along Central African longitudes on normal and counter electrojet days. On CEJ day ΔH showed a minimum over the magnetic equator and the latitudinal profile of ΔZ was reversed with respect to that during an EEJ day, with a maximum in northern and a minimum in southern fringe region of the electrojet. Rastogi (1972) showed number of examples of the disappearances of Es-q at Huancayo and Kodaikanal during the depressions of ΔH on quiet as well as on disturbed days. Thus, the presence (or absence) of equatorial Es-q during daytime was found to be an alternate parameter to the presence of EEJ (or CEJ). Based on the manual examination of the magnetograms at a number of equatorial stations Rastogi (1974) showed that CEJ identified by the depression of H field below the mean nighttime level are seen during the evening or morning hours and practically absent during the midday hours. These events were shown to be associated with the disappearance of Es-q on ionograms. Examining the ionograms at Kodaikanal for a period of 20 years (1956–1975) for no Es-q condition, Rastogi (1997) showed that CEJ during midday hours is a very rare phenomenon, occurring on about 1% of time. Further, most of these events were associated with geomagnetic active periods. 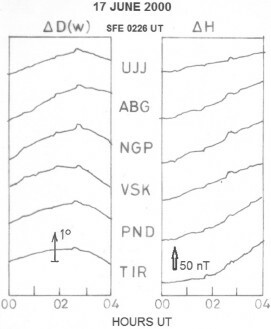 Spaced antenna drift measurements at the equatorial electrojet station Thumba, India from November 1963 to December 1969 revealed some new features of EEJ (Chandra and Rastogi, 1970; Chandra et al., 1971). 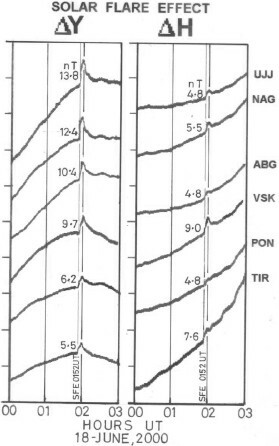 Doppler shift of VHF backscatter echoes by Jicamarca radar provided more precise E and F region drifts, from which the ionospheric electric field were estimated (Balsley, 1973). Rastogi et al. (1971) showed that the disappearance of Es-q and the CEJ at Kodaikanal were concurrent with the reversal of ionospheric drift at Thumba, confirming the reversal of ionospheric electric field during CEJ. Fambitakoye et al. (1973) showed that the disappearance of Es-q is related to the inverted latitudinal profiles of ΔH and ΔZ and not necessarily when ΔH at the equatorial station alone decreases below the night time value, discovering the phenomenon of partial counter electrojet P-CEJ event. Rastogi (1975) suggested that the ΔH at any ground EEJ station is the combined effect of an eastward ionospheric current associated with the global Sq current system together with a narrow band of electrojet current flowing eastward during normal and westward during counter electrojet period. Carter et al. (1976) did detect simultaneous opposite flowing electric current at different altitudes during the Doppler radar measurements in Western Africa. The correct estimate of the EEJ or CEJ is not when ΔH at the station close to the dip equator is above or below the night time level, but it is estimated by the difference of ΔH at the equatorial and another off equatorial station both being along the same longitude sector (Rastogi, 1974; Rastogi et al., 1977). The first recorded observation of the white light solar flare and simultaneous disturbances in geomagnetic field (crochet) were independently reported by Carrington (1859) and Hodgson (1859). Later, it was discovered that chromospheric eruptions, geomagnetic crochet and short wave fadeouts (SWF) were concomitant phenomena (Dellinger, 1935; Torroson et al., 1936; Fleming, 1937; Richardson, 1937). McNish (1937) examined the effects of above mentioned three events in 1936 on the magnetic recordings at 18 stations in Western Europe, America and southern Pacific areas. He concluded that the solar flare effect (SFE) is an augmentation of the normal daily variation over the sunlit hemisphere both in direction and magnitude supposedly due to increased atmospheric ionization by ultra violet light from the solar eruption. Richmond and Venkateswaran (1971) suggested that crochets are composite of a fast component presumably produced by solar UV radiation (100-1000 Å and a slow component produced by soft X rays (1–100 Å). Earlier studies at different latitudes suggested occurrence of SFE to be maximum around local noon, however possibility of SFE in the night time has been reported (Ohshio, 1964; Ohshio et al., 1963; Sastri, 1975a, b). The current layer responsible for SFE has been pointed to be below the normal Sq layer (Volland and Taubenheim, 1958; Veldkamp and Van Sabben, 1960; Pinter, 1967). This is because the photo-ionization due to flare associated X-rays is at a lower altitude than that due to regular radiation. 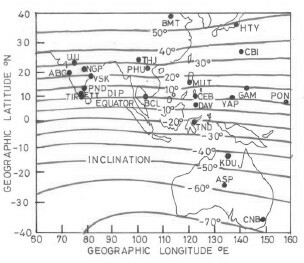 Nagata (1952) compared the SFE at the equatorial stations, Huancayo, Peru, Kakioka, and Watheroo. He found that the magnitude of crochet is abnormally large at Huancayo than at Kakioka or Watheroo. However, the ratio ΔH(SFE)/Range H(Sq) were not significantly different at the three places. He suggested that there may be a narrow zone of the ionosphere of high electrical conductivity over the magnetic equator. Forbush and Casaverde (1961) showed that the enhancement of SFE in H over the dip equator in Peru varied in a manner similar to the Sq (H) variation in equatorial latitudes. Rastogi (1965) showed that the equatorial variations of enhancements in SFE (H) and Sq (H) were more pronounced in the American than in Indian longitude, corresponding to similar longitudinal variation of the EEJ itself (Rastogi, 1962). Kuwashima and Umai (1985) described SFEs at Japanese stations Memanbetsu, Kakioka-Kanoya and Chichijima. It was shown that SFE in H field were always positive at lower latitude stations Chichijima and very small at Kakioka and negative at northern stations Kanoya, Kakioka or Memambetsu on different occasions. This was due to changing latitude of Sq focus. Rangarajan and Rastogi (1981) described the effect of a solar flare at 0120 UT on 21 June 1980 in ΔH at EEJ stations in Indian and Pacific longitudes. At Trivandrum (0708 LT) and Annamalainagar (0719 LT) a negative crochet was recorded while at Davao (1022 LT) and Guam (1139 LT) a positive crochet was recorded. Thus, the same solar flare can produce different effects at EEJ stations separated in longitude due to the condition of pre-flare ΔH situation. Rastogi (2003) described the study of SFE on all the three components of the geomagnetic field at Huancayo for the period 1957–1977. Examples of positive and negative crochet were shown during the EEJ and partial or full CEJ events, respectively. Rastogi et al. (1999) have described SFEs at Indo-USSR chain of stations extending from magnetic latitudes 0° to 45°N, during normal electrojet, partial counter electrojet and full counter electrojet periods. The solar flare at 1250 LT produced negative ΔH at equatorial stations Trivan-drum, Etyiapuram and Kodaikanal, practically no impulse at Annamalainagar, positive impulse at off equatorial stations Hyderabad, Alibag, Ujjain, Sabhawala, again zero impulse at stations close to Sq focus, Tashkent, Alma Ata and Karazande but again negative excursion at northern stations. This clearly showed that the SFE is similar to the EEJ current at equatorial station and to the Sq current at low, middle and high latitudes. Yamazaki et al. (2009) described two unique SFEs at stations of Circum-pan Pacific Magnetometer Network (CPMN) with negative impulse at equatorial electrojet stations during the local noon time hours which they denoted by SFE*. They observed the counter-Sq SFE in limited longitude (local time) and latitude sectors (i.e. LT ~ 1030–1300, Dip Lat. ≤ 1.5°). The deviations from the night time base level were positive so they felt that this type of SFE cannot be explained by the same mechanism as the morning or evening counter electrojet and its generation mechanism is not well understood. In this paper we have reexamined the geomagnetic data at Indian and western Pacific longitude sectors during the two solar flare events. Figures 1(a), (b), (c) show the intensity of solar X-ray radiations as recorded by satellite GOES-8 during the solar flares at 0226–0248 UT on 17 June 2000, at 0155–0215 on 18 June 2000 and at 0209–0250 UT on 3 July 2002 as per the SPIDR website. The three flares occurred around 02–03 UT which corresponded to the midday hours at western Pacific longitudes, when one expects a maximum of the geomagnetic field variation at equatorial and low latitude stations. Intensity of solar X-ray radiations on 0.5–3.0 Å and 1.0–8.0 Å bands observed by satellite GOES-8 during the solar flare at (a) 0226–0248 UT on 17 July 2008; (b) 0155–0215 UT on 18 July 2000 and (c) 0209–0250 UT on 03 July 2002. Most of the ground magnetometer data are from the Circum-pan Pacific Magnetometer Network stations described earlier by Yumoto and the CPMN Group (2001). Additional data for Pacific longitudes were downloaded from WDC for Geomagnetism, Kyoto (http://wdc.kugi.Kyoto-u.ac.jp). The data for Indian stations were supplied by Indian Institute of Geomagnetism, Navi Mumbai, India. The list of station and their coordinates are given in Table 1 and their locations are shown in the map in Fig. 2. It may be seen that the Indian stations are within the geographic longitude 73°–83°E and dip latitude 0.8°–18.9°N. The stations in the western Pacific sector lie between 106°–149°E longitudes with dip angle ranging from 39°N to 48°S. Some additional information was added for Ancon (11.8°S, 282.8°E, dip lat. 1.0°N) and for Kirimati (21.1°N, 202.5°E, dip lat. 2.8°N). Rastogi (2002) has shown that Kirimati is an equatorial station situated very close to the northern edge of EEJ. Map showing the location of stations whose data are utilized in the present analysis. In Fig. 3 are shown the daily variations of ΔH and ΔZ at all stations close to the dip equator for 16–17, 17–18 and 18–19 June 2000. The daily variation of ΔH at Tirunelveli (TIR) showed strong midday peak on any of these days and a strong depression on the night of 18–19 June. ΔZ showed a forenoon maximum and afternoon minimum on any of the days. This feature of ΔZ variation is different from what is expected from the Chapman model of EEJ and has been explained as the effect of induction in subsurface conducting layer (Rastogi, 2004). The daily variation of ΔH at Davao (DAV) also showed midday peak on any of these days but the magnitude of the peak was significantly smaller on 17–18 June compared to that on adjacent days. ΔZ showed forenoon maximum and afternoon minimum of larger magnitude than those at TIR. ΔH at Ponhpei (PON) showed clearly a midday diurnal peak on 16–17 June, but on 17–18 June the peak was reduced in magnitude and was superposed by a depression at noon. This feature is characteristic of Partial Counter Electrojet described by Rastogi (1975), and will be discussed later. On 18–19 June, the midday peak of ΔH was too small and large depressions below the night time base level were observed. This feature is not discussed in this paper and needs explanation. There were no changes in ΔZ indicating that the station was very close to the dip equator. Daily variations of ΔH and ΔZ at equatorial stations ANC, CRI, PON, DAV, TIR for 17 to 19 June 2000. At Kirimati (CRI) the daily variations of ΔZ were of opposite phase to that of ΔH. Kirimati has been shown to be close to the northern fringe region of EEJ and ΔZ is expected to show large negative variation during midday hours (Rastogi, 2002). On 18–19 June the daily peak of ΔH was greatly reduced and a partial counter electrojet event was also present. At Ancon (ANC), ΔH showed close daily peaks and ΔZ showed small minimum on any of the days, characteristic of an EEJ station slightly north of the dip equator. No disturbance in the electrojet currents seems to be present on any of the days at Ancon. In Fig. 4(a) are shown the monthly mean Sq variations of ΔH during June 2000 and the daily variations of ΔH on 18 June 2000 at stations Ujjain (UJJ), Alibag (ABG), Pondicherry (PND), Kodaikanal (KOD) and Tirunelveli (TIR) in the Indian sector. The difference of ΔH at TIR and ABG, ΔH (TIR-ABG), on 18 July 2000 is also shown in the figure. It is seen that at any of the station ΔH on 18 June was larger during the forenoon hours and smaller during the afternoon hours as compared to the corresponding SqH. The monthly mean ΔH (TIR-ABG) showed a peak around the midday hours but on 18 June 2000 a peak around 09 h LT and a minimum around 15 h LT was observed. These features are the characteristics of luni-solar tides causing a counter electrojet in the afternoon hours (Bhargava and Sastri, 1977). (a) The mean (5 quiet days) daily variation of ΔH for June 2000 and for 18 June 2000 at TIR, KOD, PND, ABG, UJJ in the Indian region. Also plotted is the difference of ΔH at TIR and ABG on 18 June 2000 and the mean for 5 quiet days of June 2000. (b) Daily variations of ΔH on 18 June 2000 minus SqH at TIR, ABG and SAB. Also shown are the daily variations of Dst and IMF-Bz on 18 June 2000. In Fig. 4(b) are shown the ΔH on 18 June 2000 minus SqH (June 2000) for stations TIR, ABG and SAB. Corresponding variations of Dst index and hourly mean IMF-Bz on 18 June 2000 are also shown. It is seen that Dst indices were very low on 18 June 2000 indicating a magnetically quiet day. The semi diurnal character of ΔH is clearly seen at TIR and ABG while ΔH at Sabhawala (SAB) a station close to the Sq focus region is primarily diurnal with a peak at noon. There was a single depressed value of IMF-Bz at 14–15 hr LT which does not seem to suggest causing the counter electrojet. In Fig. 5 are shown the daily variations of ΔH on 18 June 2000 and the monthly mean Sq variations of ΔH for June 2000 for different stations in the western Pacific sector. At low latitude stations outside the EEJ belt, e.g. Chichijima (CBI), Tonghat (THJ), Phu Thuy (PHU) in the northern hemisphere as well at Tondano (TND) and Kakadu (KDU) in the southern hemisphere, daily variation of ΔH on 18 June 2000 were significantly larger than the corresponding curves for the monthly mean ΔH variations, suggesting that the mid latitude global current system was stronger on 18th June compared to the same averaged over the whole month of June 2000. On the contrary, daily variations of H at equatorial stations, Davao (DAV) and Pohnpei (PON) were much smaller on 18 June than the monthly mean curves. It is interesting to note a significant decrease of ΔH at PON during 13–14 h LT. 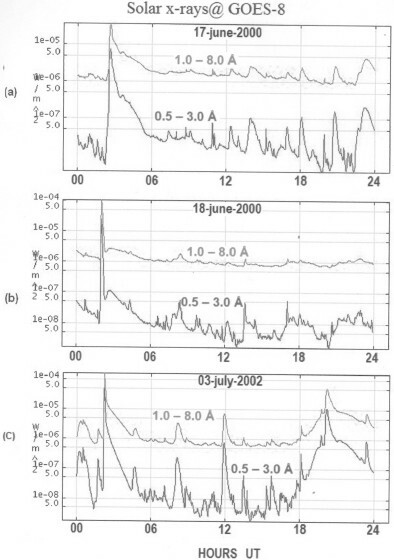 The difference of ΔH at PON and PHU, an indicator of the equatorial electrojet strength is also shown in the figure indicating CEJ between 06 and 12 h LT.
Daily variations of ΔH on 18 June 2000 and of the monthly mean SqH for June 2000 at different stations in the western Pacific region. In Fig. 6(a) are plotted variations with dip angle of ΔH at each hour from 1030 h LT to 1530 h LT, averaged over five IQ days of June 2000 for Indian longitude sector. It is seen that ΔH showed monotonous increase with decreasing dip latitude, characteristic of low latitude current system with a peak of ΔH over the dip equator. Figure 6(b) shows similar curves for 18 June 2000. AT 1030 h LT 1130 h LT and 1230 h LT, ΔH showed an enhancement over the dip equator suggesting a normal electrojet current during these hours. At 1330 LT a plateau of ΔH occurred around 10° dip angle and a peak over the dip equator was still present. This shows that a partial electrojet had developed then. At 1430 LT and 1530 LT, ΔH was maximum at 25° dip and decreased continuously from 25° to 0° dip suggesting the development of a full counter electrojet condition, evident by the variation of the difference in ΔH at Trivandrum and Alibag (shown in Fig. 4(a)). 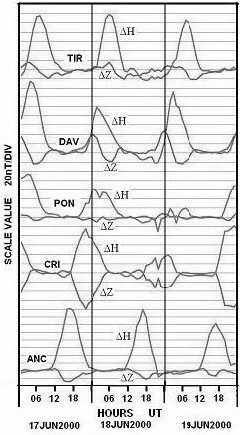 Thus, a latitudinal plot of ΔH is shown to be a good index of the presence of a normal or counter electrojet condition. The difference of ΔH at equatorial electrojet station PON minus the same at low latitude station PHU shows a counter electrojet event between 06–12 h LT (Fig. 5). 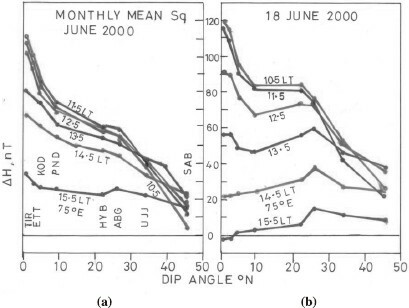 (a) Variations with the dip angle of the mean (5 quiet days) value of ΔH for June 2000 for the stations in the Indian region at selected hours and (b) Variations with the dip angle of ΔH on 18 June 2000 at the stations in the Indian region at selected hours. Latitudinal plots of ΔH for selected hours (08, 10 and 12 h LT) on 18 June 2000 and of the monthly mean value of ΔH for June 2000 for the western Pacific longitudinal sector are shown in Fig. 7(a) and Fig. 7(b) respectively. The monthly mean curves clearly show equatorial enhancements of ΔH during the day time hours. On 18 June 2000, ΔH was seen to decrease with decreasing latitude suggesting the existence of the counter electrojet on that day in Pacific sector. 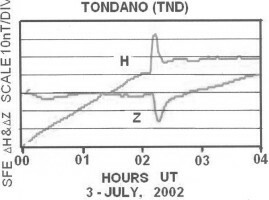 It is interesting to note that ΔH at PON on 18 June 2000 showed a large depression between 0800–1300 LT. Thus, the counter electrojet conditions prevailed at stations in western Pacific region almost since sunrise on 18 June 2000. 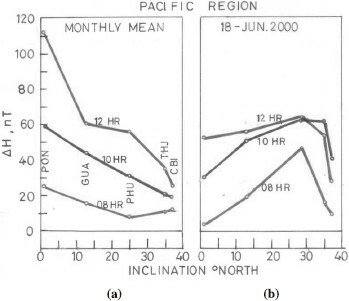 (a) Variations with the dip angle of the mean (5 quiet days) value of ΔH for June 2000 for the stations in the western Pacific region at selected hours and (b) Variations with the dip angle of ΔH on 18 June 2000 at the stations in the western Pacific region at selected hours. In Fig. 8 are shown the portions of magnetograms (H and D) on 17 June 2000 at stations in Indian network. The time of solar flare (0226 UT) corresponded to early morning hours (08 LT) when the Sq as well as EEJ currents were first developing after sunrise and the direction of current vectors were mostly southward at low latitudes and eastward at equatorial latitudes. The SFE in H as well as Y (D) was positive at all stations. The magnitude of SFE in H is small at all stations but higher at stations UJJ, ABG, NGP and VSK than the stations PND and TIR, stations closest to the dip equator. The SFE in Y (D) increased progressively with increasing latitude and was largest at Ujjain (UJJ). Magnetograms showing the solar flare effects in Declination (D) and H fields at 0226 UT on 17 June 2000 at stations in Indian region. In Fig. 9 are shown portions of magnetograms (H) to show the SFE at 0226 h UT on 17 June 2000 at stations in the western Pacific region. The local time of the flare was close to 11 h LT when the intensity of the electrojet attains its daily peak. The impulse is seen to be positive at all stations and the amplitude decreasing with increasing latitude of the station. Magnetograms showing the solar flare effects in H at 0226 UT on 17 June 2000 at stations in western Pacific regions. Figure 10 shows the portions of Y and H magnetograms at Indian stations during the solar flare at 0152 h UT (0722 h LT) on 18 June 2000. The impulse in ΔH was positive at every station. The impulse in ΔH indicated a general decrease with increasing latitude. The impulse in ΔY due to solar flare was positive at each of the station, corresponding to the positive values of ΔY at each station prior to the flare. The amplitude ΔY clearly shows an increase with increasing latitude. This can be explained because in the morning hours the current vector is inclined south-east at equatorial stations turning southward with increasing latitudes. This confirms the general characteristics of a solar flare effects during a normal equatorial electrojet periods. Solar flare effects on Y and H components of the geomagnetic field at 0152 h UT on 18 July 2000 at stations in the Indian region. Figure 11 shows the portions of H magnetograms during the solar flare at 0152 UT (12 h LT) on 18 June 2000 at stations along western Pacific longitudes. At BMT, a station poleward of Sq focus latitude, both the pre-flare ΔH and SFE impulse were negative. At low latitude stations HTY, CBI, PHU and MUT the solar flare had occurred during the rising ΔH in the forenoon hours and the SFE (H) were positive at each of these stations. At GAM, a station just outside the EEJ belt, there was a distinct depression in ΔH around 02–03 UT and the ΔH (SFE) was small but still positive, suggesting that the presence of a partial CEJ had reduced the amplitude of ΔH (SFE) compared to the same at higher latitudes. At PON, an EEJ station, both the pre-flare ΔH as well as ΔH (SFE) were strongly negative, suggesting that the electrojet component of the total current was westward and stronger than the Sq component of the current. At DAV, only 1.6° S of the magnetic equator, ΔH (SFE) was positive because the local time of SFE at DAV was around 10 hr compared to 12 hr at PON and so the CEJ had not developed enough to cancel the Sq component of the total current. At southern low latitude stations KDU (41°S) and ASP (56° S) the ΔH impulses due to the solar flare were definitely positive. The H magnetograms at stations in the western Pacific region showing the effects of solar flare at 0152 h UT on 18 June 2000. Referring to Fig. 7, the latitudinal variation of ΔH during the forenoon hours at stations in the western Pacific region showed decreasing value with decreasing latitudes, suggesting a partial counter electrojet. This partial counter electro-jet was the cause of the negative impulse in H due to the solar flare. During the period of CEJ, ΔH at the equatorial station should be negative and ΔZ at a northern low latitude station at the edge of EEJ belt should be positive. To further check the status of EEJ current during the solar flare we have reproduced in Fig. 12 the variation of solar X ray flux, ΔH at PON and ΔZ at MUT during the period of solar flare. It is seen that ΔH at PON was negative and ΔZ at MUT was positive, confirming the existence of counter electrojet during the occurrence of solar flare. 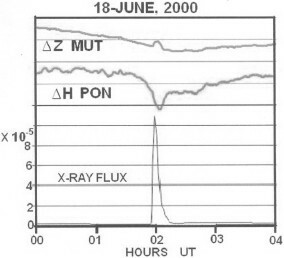 The temporal variation of solar X-ray flux, ΔH at PON and ΔZ at MUT during the solar flare at 0152 UT on 18 June 2000. Yamazaki et al. (2009) found that a linear relationship existed between the amplitude of SFE (H) and the pre-flare ΔH for non-equatorial stations (dip latitude greater than 3°) but the points for equatorial station departed significantly from the regression line. As mentioned earlier, the effect of SFE at equatorial stations occurs mainly on the EEJ component of the total equatorial current, which is identified with the ΔH at EEJ stations minus ΔH at low latitude station outside the EEJ belt. So in Fig. 13 we have replotted the data of total SFE (H) at non-equatorial stations and only the equatorial electrojet component of the total current at equatorial electrojet stations against the corresponding pre-flare ΔH value. Now a linear relationship is clearly shown between SFE (H) and pre-flare ΔH for all equatorial and non equatorial stations. The impulse of the solar flare at 0152 UT on 18 June 2000 on the H field at stations in Indian and western Pacific regions plotted against the corresponding pre-flare ΔH. Thus, the solar flare effects in the H field at low and equatorial latitudes should be viewed keeping in mind the proportions of the amplitudes of the electrojet and the Sq components of the total current at the time of solar flare. In Fig. 14 are shown the portions of Y and H magne-tograms at different Indian stations to see the effects of solar flare at 0208 UT ( 0708 LT) on 3 July 2002. As the flare occurred when the equatorial electrojet current had developed significantly, SFE (ΔH) showed increasing positive amplitudes towards the dip equator while SFE (Y) increased uniformly with increasing latitudes of the station. These features in ΔY and ΔH are in conformity with the corresponding pre-flare values of Y and H fields. The direction of SFE current vector shown in the figure is predominantly eastward at the electrojet station TIR and gradually shifts more southward with increasing northward stations PND to UJJ. This confirms that during the conditions of normal electrojet the solar flare effect is predominantly the intensification of the existing current without any change in its direction. The Y and H magnetograms at stations in the Indian region showing the effects of solar flare at 0208 UT on 3 July 2002. In Fig. 15 are shown the daily variations of hourly mean values of ΔH and ΔZ on 3 and 4 July 2002 at all the stations in western Pacific region extending from the most southward station Canberra (CNB) in Australia, through the electrojet stations PON and YAP in Micronesia to the northernmost station BMT in China. On both of these days ΔH showed a midday peak at equatorial and low latitude stations and reversing to midday minimum at stations poleward from the Sq focus region e.g. at BMT, in the north and at ASP and CNB in the south. The variations of ΔZ at equatorial stations are low. The value of ΔZ around midday hours is negative at low latitude stations in the north and positive at stations in the south. These features of ΔH and ΔZ are in conformity with those expected of the Chapman’s (1951) model of equatorial electrojet. Thus the days 3 July and 4 July, in the first sight seem to be the case of a normal equatorial electrojet. The daily variations of hourly mean ΔH and ΔZ on 3 and 4 July 2002 at stations in the western Pacific region. In Fig. 16 are shown the latitudinal variations of ΔH at different hours of the forenoon and afternoon periods of 3 July 2002 for the Pacific region. Strangely, the day started with a well defined depression centered at the equatorial station YAP and this feature continued for some time beyond the noon up to 1330 h LT. It is to be noted that ΔH at 1130 h LT was +80 nT at DAV, +85 nT at PON, +55 nT at YAP and +70 nT at GAM. Thus, there was a uniquely very narrow region of equatorial counter electrojet on 3 July 2002 in Pacific region. 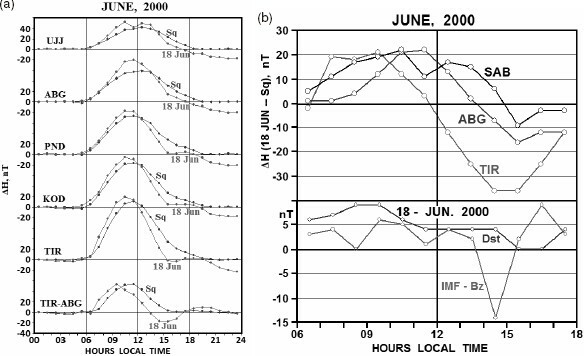 Latitudinal variations of ΔH at different hours of the forenoon and the afternoon periods on 3 July 2002 for the western Pacific region. To confirm the state of E region currents on 3 and 4 July 2002 in the western Pacific region in Fig. 17 are plotted the loops of the hourly mean values of ΔH versus ΔZ for two stations near the edge of the equatorial electrojet belt, GAM in the north and TND in the south. According to the Chapman’s model of the equatorial electrojet, an increasing value of ΔH should correspond to a decreasing value of ΔZ in the north and an increasing value of ΔZ in the south (Rastogi et al., 2010). Thus ΔH and ΔZ loop should be tilted accordingly. The diagram shows the expected trend of the loops for 4 July 2002. 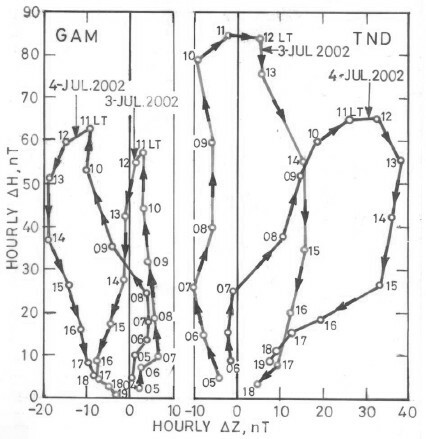 While on 3 July 2002 the ΔH and ΔZ loops for either the northern or the southern station does not show any tilt, suggesting that an increasing ΔH did not produce significant change in ΔZ throughout the day. This can be explained by the fact that the changes in ΔZ due to eastward Sq related current was compensated by the ΔZ changes due to a westward counter electrojet flowing at a lower height. Thus, it is to be concluded that a counter electrojet was present in the Pacific region throughout the whole day on 3 July 2002. Plots of hourly mean value of ΔH versus ΔZ on 3 and 4 July 2002 at stations near the fringe of equatorial electrojet belt in the north at GAM and in the south at TND. In Fig. 18 are shown the H magnetograms at different stations in the western Pacific region during the solar flare between 0209–0250 h UT on 3 July 2002. At low latitude stations outside EEJ belt GAM, PHU, CBI and HTY in the north and at TND, KDU, and ASP in the south, the solar flare had produced a significant positive impulse in the H field. At stations outside the Sq current loop, BMT in the north and CNB in the south the impulse in ΔH was negative. It is very interesting to find that the impulse in ΔH at the EEJ stations YAP, PON and DAV were strongly negative. The H magnetogram at different stations in the western Pacific region during the solar flare between 0209–0250 UT on 3 July 2002. To confirm the direction of solar flare induced current over the EEJ region, in Fig. 19 are plotted portions of H and Z magnetograms at a low latitude station TND in the south. The negative ΔZ over TND indicates a westward current over equator but the positive ΔH over TND indicates the presence of eastward Sq current over this station. Thus the westward CEJ due to the SFE is confined to the dip equator only and probably the ΔH due to the solar flare effect of CEJ is not significantly modifying the ΔH due to Sq over TND. The H and Z magnetogram at southern low latitude station, Tondano (TND) during the solar flare 0205–0255 UT on 3 July 2002. In Fig. 20 are plotted the flare induced ΔH versus the pre-flare ΔH values. The values of ΔH at EEJ stations are corrected for the Sq related component. 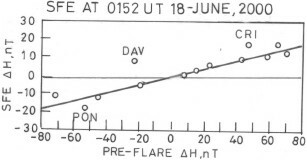 It is seen that the points lie fairly well on a straight line indicating the enhancement of flare induced ΔH proportional to ΔH existing just before the start of the flare. The impulse of the solar flare at 0208 UT on 3 July 2002 on the H field at stations in Indian and western Pacific regions plotted against the corresponding pre-flare ΔH. Yamazaki et al. (2009) examined SFE at CPMN stations for the period 1998–2005 and out of the 117 cases of SFE identified the two events of negative SFE of 18 June 2000 and 3 July 2002 that occurred near local noon. The negative SFE or SFE* were found to occur in limited longitude/time (≈1030–1300 LT) and latitude (≤1.5° dip latitude). The amplitude of the SFE* (H) for the 18 June 2000 event was -15.9 nT at PON and at nearby stations DAV and CRI the amplitudes were 10.1 and 17.8 nT respectively. For the 3 Jul 2002 event the SFE* (H) amplitudes were −28.4, −25.9 and −22.9 nT at DAV, YAP and PON respectively. The current vector for the SFE* event was found to be opposite to that of Sq around noon. However the current vector for SFE and Sq were same for the latitudes outside equatorial region. For non equatorial stations linear relationship was shown between amplitude of SFE* (H) and pre-flare Sq(H). Points of the stations where SFE(H) were observed were near the best-fit line but for the stations with SFE* (H) significant departure from the best-fit line was observed. They also reported that for both the events rapid northward turning of IMF-Bz was seen and the decrease of H at CRI and PON on 18 June 2000 and at PON on 3 July 2002, could be due to the prompt penetration of electric field (over-shielding). However the events occurred under geomagnetic quiet conditions, and so they concluded that the origin of westward electric field remained to be understood. The present analysis shows that on 18 June 2000 a partial counter electrojet was observed in both the Indian and CPMN longitude sectors. Also a partial counter electrojet existed in the CPMN sector on 3 July 2002. The stations close to dip equator thus showed negative SFE. Also the plot of the amplitude of SFE(H) on 18 June 2000 against pre-flare ΔH, corrected for Sq(H) component showed a linear relationship. Similar plot for 3 July 2002 again showed a linear relationship though the points for YAP and DAV showed departure from the best-fit line. Yamazaki et al. (2009) pointed that the local current system, other than the global Sq current system might be responsible for the generation of SFE*. The equatorial electrojet current peak is considered to be around 107 km in contrast to the global Sq current peak around 115–120 km. Onwumechili (1992) studied 76 rocket-borne magnetometer flights conducted at different latitude sectors that showed daytime peak eastward current around 107 km in the electrojet region or two layers of eastward current, one at 107 km and another (much weaker) at 136 km. Between 2° dip latitude and the Sq focus there are two layers of eastward current centered around 105 km and 123 km. The lower layer is not seen at stations beyond the Sq focus. Further the lower layer flows westward between 4° and 7° dip latitude. Thus the lower layer of intense eastward current flowing within 2–4° from dip equator with westward current peaking around 4° to 7° dip latitude is the electrojet current system. The two current systems, global Sq and equatorial electrojet are coupled and some times overlapping. The appearance of Es-q at 100 km is associated with eastward electric field and its disappearance during counter electrojet with westward electric field. This has been confirmed both by spaced receiver drift measurements at Thumba in India and later by VHF radar measurements from Jicamarca. Daytime reversal of current from eastward to westward in the electrojet region, on some occasions, do not give rise to depression in ground geomagnetic H field. 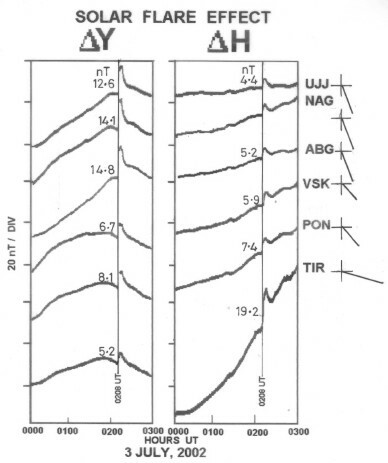 Rastogi (1975) suggested that the ΔH at any ground EEJ station is the combined effect of an eastward ionospheric current associated with the global Sq current system together with a narrow band of electrojet current flowing eastward during normal and westward during counter electrojet period. Thus the ground geomagnetic field variation in the electrojet region results from an eastward flowing Sq current peaking around 115–120 km and an eastward or westward flowing current around 107 km. Solar flares would affect the electrojet current more than the global current as shorter wavelengths of the flare spectrum are generally absorbed in the lower regions of ionosphere. Solar flare effects (SFEs) are examined in the Indian and western Pacific longitude sectors for the two events of negative SFE observed around midday at equatorial stations of CPMN network on 18 June 2000 and 3 July 2002. Both the midday events of negative SFE(H) at equatorial CPMN stations were associated with partial counter electrojet. The amplitude of SFE(H) showed a linear relationship with pre-flare ΔH after correction is made for the Sq(H) component at electrojet stations. The crochets in H during a normal electrojet period are positive at equatorial as well as other low latitude stations. During a partial counter electrojet ΔH at electrojet stations could be negative in comparison to positive impulse at low latitude stations outside the electrojet region. The equatorial electrojet current peak is around 107 km in contrast to the global Sq current peak around 115–120 km. Global Sq current flows eastward during the day time and the equatorial electrojet current flows eastward during daytime on normal electrojet and westward during counter electrojet conditions. It is likely that solar flares affect the eletrojet current more than the global current as shorter wavelengths of the flare spectrum are generally absorbed in the lower regions of ionosphere. Thanks are due to Indian Institute of Geomagnetism for the copies of magnetograms from Indian stations. Thanks are also due to World Data Center at Kyoto, SPIDR at Boulder for other data used here. Thanks are due to Physical Research Laboratory for the facilities provided.